The Acer Chromebook 11 is as good as Chromebooks get. Indeed, it's good enough to consider it over an Android 2-in-1 or even low-end Windows laptop. In the early days Chromebooks were fairly limited things without an internet connection and would only let you install a handful of Chrome extension apps. That's no longer the case: Chromebooks just got a lot more fun. The Acer Chromebook 11 is one of the first to launch with Google Play app support, which changes the outlook completely. You now get the low cost of Chrome OS hardware with the fun of an Android tablet. This particular Chromebook is a great way to kick off the next stage of Chrome OS, too, thanks to a solid build, good screen, and all-day battery life. Oh, and it's only £180. What's missing? Well, the Acer Chromebook 11 isn't going to challenge an Apple MacBook on style. Where the Chromebook R11 has an aluminium plate on its lid, the plain Chromebook 11 is plastic all the way, including its lid, keyboard surround and underside. There's a sort-of pinstripe texture on the lid and a two-tone look to the keyboard surround to stop you falling asleep just by looking at the thing, but it's practical rather than flashy. This grey-on-white mix isn't just there for the look, though, as grey parts are rubberised to soak up impact force better than hard plastic. The Chromebook 11 is less dumpy-looking than the Chromebook 11 N7 we looked at recently, too. Where the latter laptop has the military-grade ruggedness to endure the careless treatment of a classroom of 30 pre-GCSE kids, the 11 is a bit slimmer, less well-armoured. That's not to say it's poorly-made, though. Anything but: a plastic laptop like this is never going to feel super-expensive, but it is still very sturdy. The keyboard doesn't flex, the screen half is nice and rigid. You can get it to creak a little if you try, but the Acer Chromebook 11 does not feel cheaply-made. Given it is cheap, that's a solid achievement. There's a modern look to the screen too. The 11.6-inch screen uses a decent IPS LCD panel. Sure, it's low resolution, but colour is satisfying, albeit a little undersaturated, and the display layer doesn't appear recessed. Contrast is very good, and in the context of a cheap laptop the image doesn't seem too pixelated. It's a touchscreen, too, and like previous R11-series Chromebooks is also a hybrid. The hinge flips 360 degrees to make it act more like an all-in-one touchscreen PC or a big home-bound tablet. Fold over the screen beyond 180 degrees and the keyboard automatically disables. There is quite a lot of competition here, though. 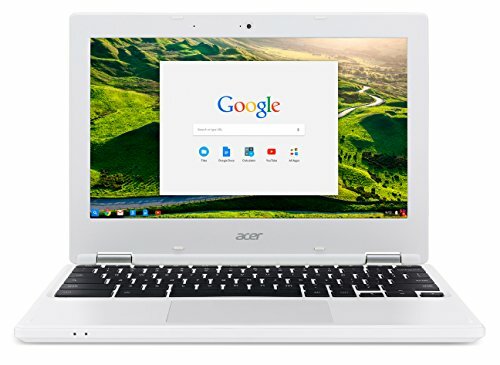 For a little more money you can get a 14-inch Acer Chromebook with a 1080p screen, although the Chromebook 11's resolution is the standard for this 11-inch size. Forget about the resolution and the Chromebook 11 otherwise seems almost bizarrely comparable to that of a £600-800 Windows laptop. This model's keyboard isn't quite as well-defined and stiff as the chunky Acer Chromebook N7 11, but it's still similar to that of a decent Ultrabook. The keys aren't spongy or cramped, and we've typed thousands of words on it for hours at a time without wishing we could switch back to our normal work laptop, an old-gen MacBook Pro. There is no keyboard backlight, but that's no surprise at the price. Similarly, the Acer Chromebook 11 has a plastic trackpad rather than a glass one, but it feels pretty good anyway. The clicker is heavier than some, but only slightly. There's none of the strange trackpad behaviour you get with some lower-cost Windows laptops either. The version Acer sent us has a US keyboard, but with any luck you'll get a UK one if you buy it from a reliable UK retailer. So far, the Acer Chromebook 11 has given us the basics, performed well but without much extra to shout about. The connections do have extras. That may sound boring, but it's important. These days laptops tend to either side with the past, with full-size USBs, or go with the future and use USB Type-C. The Acer Chromebook 11 has both: with two USB 3.0 ports and two USB-Cs, it's flexible for the here and now and the future. This is the perfect array for a Chromebook, particularly when you tend to only get two main connectors anyway. There's also a microSD slot, to add to the 32GB of on-board storage. If you just want to use Word-like apps then that storage will be ok, but it'll get eaten up if you start storing handfuls or movies or install all of Android's most popular games. Fortiunately microSD cards aren't too expensive. Google Play support opens-up the abilities of a Chromebook like the Acer Chromebook 11 hugely, making it a real alternative to a Windows laptop or more expensive hybrid. You can zoom around Google Play just as you would on a tablet - it feels just the same. Almost all the apps and games we tried worked well, although there are clear signs you're not running them on a native system. Like any new feature, Google Play support is a bit buggy. Many apps don't run full-screen to start, making it look as though you're running them through phone emulator software. They need to restart to "go full-screen" and if you do this as you first run the app it can mess it up completely, requiring a re-install. Similarly, some games will only work with the touchscreen, and others require manual mapping of the keyboard to use it as a controller. It's a bit of a tinkerer's paradise, though. The ePSXe PlayStation emulator works perfectly, for example. High-end games like Asphalt 8 - which works as standard with the keyboard - aren't lag-free, but stutteriness is most obvious in the menus rather than as you play. No game we've tried runs slow enough on the Chromebook 11 to spoil the fun. And this is a mere Chromebook, so that's impressive. The last budget Chromebook we reviewed struggled a lot with the native Chrome first-person shooter game GoreScript, frequently dropping to single digit frames per second. With the Chromebook 11 you get 30fps most of the time, with only occasional stuttery moments. It's because the Acer Chromebook 11 uses a newer Intel Celeron CPU. This central processing unit has a power equivalent similar to a low-midrange smartphone. Some of our tests suggest the Acer Chromebook 11 only uses one of its two processing cores when running Android apps, although we can't be sure of this at present and it only means performance will get better when Google Play support is improved further. Having Android apps also lets you use, for example, Microsoft Word rather than relying on Google Docs when you need to type something. You can store all the Acer Chromebook 11's data locally if you like, where back in Chrome OS's early days cloud storage was mandated. There are some slightly odd moves in the Acer Chromebook 11's hardware, though. It has two cameras: a low-quality VGA one above the screen and a better (but still bad) 5MP one above the keyboard. It's a weird place to put a camera, but turns into the rear camera when the laptop is used more like a tablet, with the keyboard flipped around. However, it ends up at the bottom of the screen's back and not all apps turn the Acer Chromebook 11 around when you flip the device to correct this. It's another Android app bit that needs fixing in Chrome OS. On a brighter note, the Acer Chromebook 11's speakers are quite usable. Max volume is good for a bottom-rung laptop, the side-loaded stereo drivers give a wide-ish image, and there's some chunkiness to the sound. Treble is a bit soft, making it a little boxy-sounding, but these speakers could be much worse. Battery life is another highlight. Thanks to Chrome OS's low overhead, you'll get around 9.5 hours of use when just typing. Start playing games and that figure will drop, of course, but despite all the extra fun stuff Chromebooks just earned, we still think of them as perfect for low-level work above all else.If you just want to muck around with apps, why not buy an Android tablet? The Acer Chromebook 11 is charged using one of the USB-C ports, and takes a couple of hours to recharge. If you need design excitement, you won't get it from the Acer Chromebook 11. This Chromebook is plastic, with just a few little flourishes to separate it from the laptop dummy you might see in a showroom. However, it's smartly made, portable, and has more than enough substance to make up for the lack of pizzazz. The screen is great despite the low resolution, the keyboard very good, and the processor has just enough power to make good use of Chrome OS's new ability to use Android apps. The flippy 360-degree hinge and touchscreen finally make sense too. Android apps don't work 100 per cent seamlessly with Chromebooks yet, but the experience is good enough to make this level-up a whole new reason to buy one. The Chromebook 11's ultra-rugged brother didn't have Google Play support when we reviewed it, but it may well do now. Its main benefit is an even better keyboard and rugged chops that let it soak-up a whole can's worth of drink without damage. It's chunkier and has a much less appealing screen (in the non-touch version at least), though, so unless you're perennially clumsy, the 11 is a better buy. The Chromebook C302CA has the higher-end design the 11 lacks, with an all-metal case. It also has a sharper screen, although we're not convinced the display is miles better in all respects. Most important, it has a Core m3 processor rather than the low-end Celeron type used here, which shed the last little gaming performance hiccups we see in the Acer. But is worth an extra £300? For many people, probably not. The Chromebook 11's Windows sibling, the Spin 1 looks quite a lot like the 11 but somehow manages to fit in a 1080p screen for a little more cash. These laptops' specs are otherwise almost identical, so is the Spin 1 really the better deal? It's the comparison that proves the worth of Chromebooks as Windows 10 just doesn't run that well with a Celeron N3350 processor. Chrome OS does.